Rosie likes to watch the fish. Hanging out with me; relaxing at the pond. Beautiful Rosie in your beautiful pond 😀 What kind of fish did you put in there Stacey? 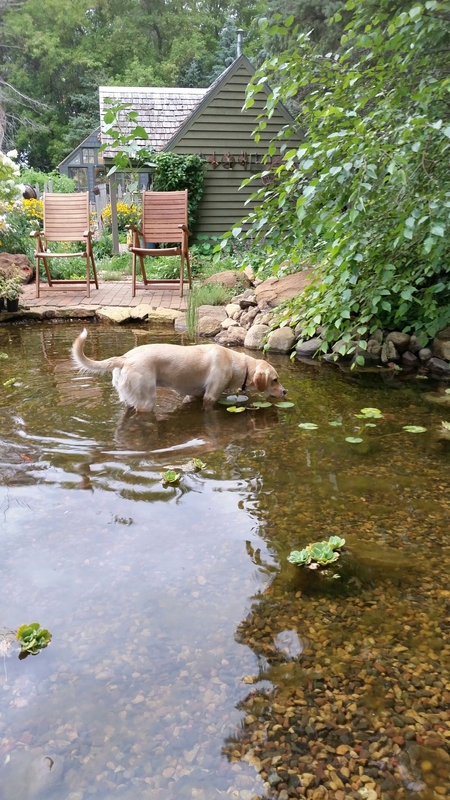 The water is so clear, I love that Rosie can wander in and cool off and get some fishy entertainment. Oh, I so want a pond but it will have to be small and I wonder if my fur friend Mojo will make it his summer retreat? I think I have my answer seeing Rosie! Oh, the things dogs love to do! That is a beautiful photo.